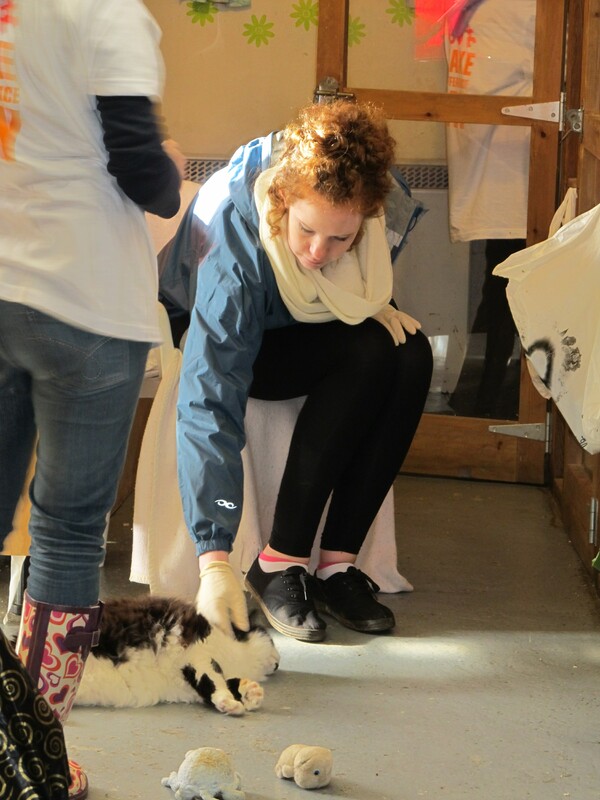 On Saturday 27th October 6 students from the Lancaster and Carlisle campus’s went along to the Eden Animal Rescue, near Shap, to volunteer for Make a Difference Day. 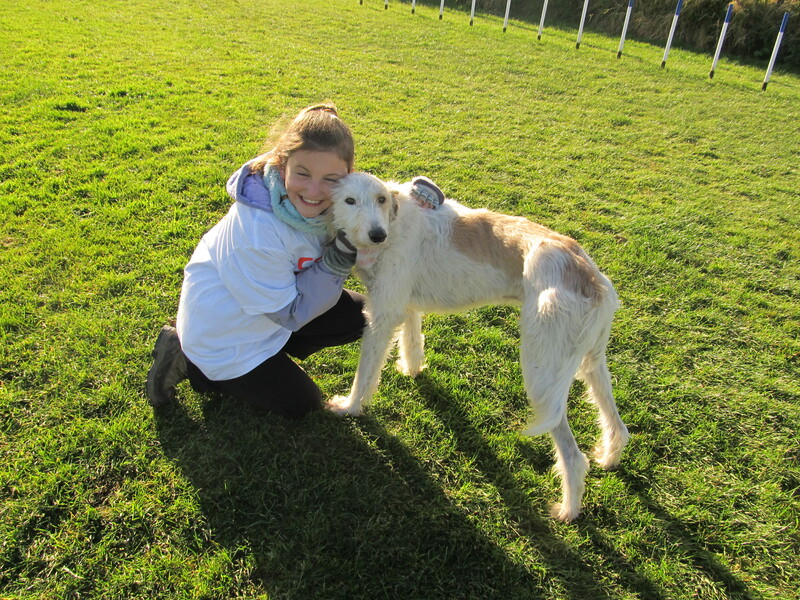 It was a freezing start to the day that was all made worthwhile when we were introduced to the animals on site. 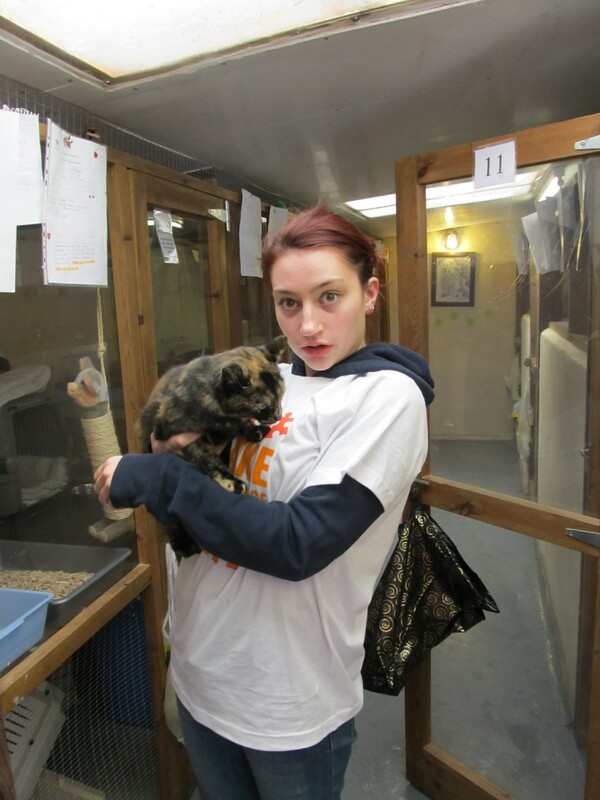 Annually the rescue centre cares for an average of 400 cats, 150 dogs, not to mention many hedgehogs, wild birds, rabbits, hamsters and any other animals which come their way and having only two part time employees, volunteers are a huge help. 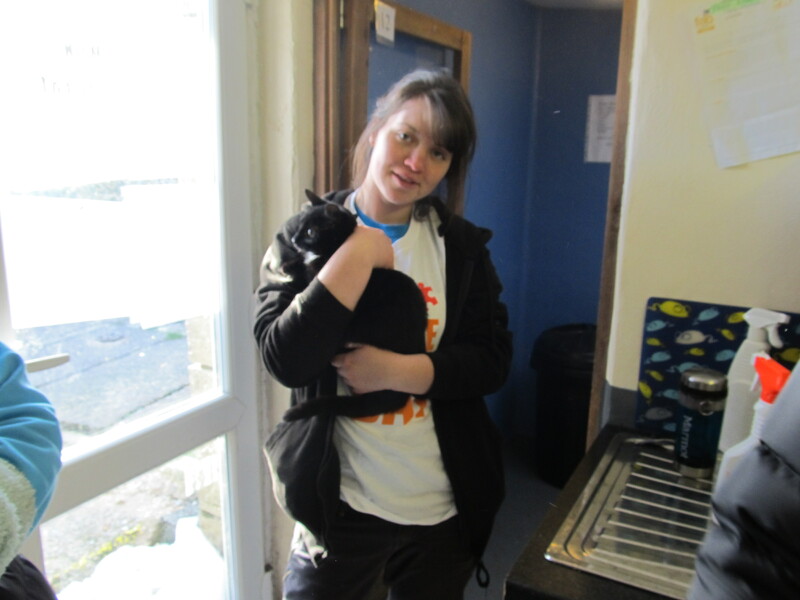 Members of the public are able to drop by the centre and look at the animals, keeping the staff extremely busy as they need to spend time with the potential owners going through all the background info and with the hope of the animals going to a suitable, loving home. There are many ways that volunteers can help with the running of the centre from cleaning and feeding, collecting and sorting donations, DIY projects, excercising the dogs and more. The student volunteers were able to help by spending time walking the dogs and spending time with the cats, giving them lots of attention out of their cages which is something that wouldn’t be able to happen as much without the help of volunteers and it’s something that makes a big difference to the happiness of the animals. 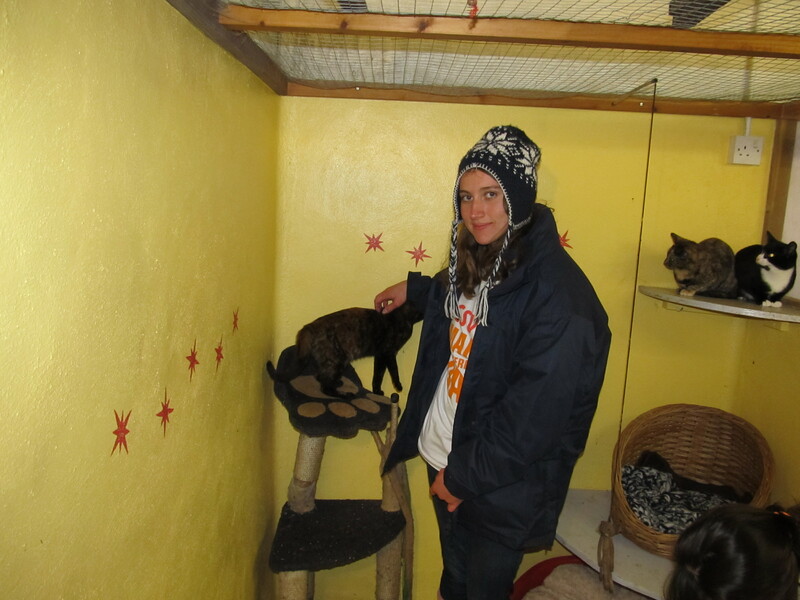 Whilst at the centre the volunteers were also told some sad stories about animals that have had a bad time before coming to the centre. Some of the dog cages were were marked with an amber or a red tag which meant that volunteers were not able to work with these until they were more experienced as their temperment could change and the dogs would need more training and support from experienced staff and volunteers. The staff explained that some of these dogs have sufferered from neglect and cruely and that Eden Animal Rescue aims to relieve the suffering and distress of all animals in need of care and attention, and to arrange for the provision of good homes for them. 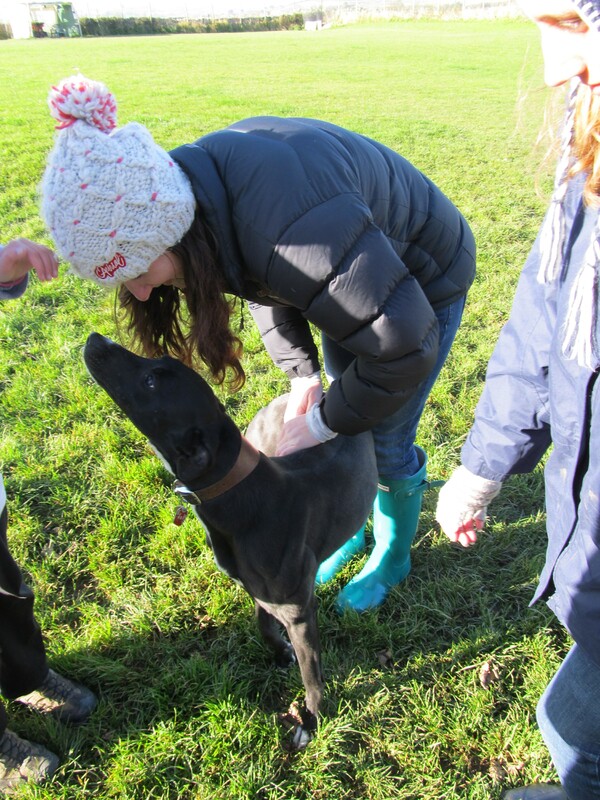 It was really nice to hear that whilst some dogs had suffered in the past and had been on amber and red tags initially, with the help of volunteers and staff they were able to do a lot of work with them to help them recover and that they are now very loving around people and have been rehomed. In June 2012 I set off on the biggest adventure of my life! 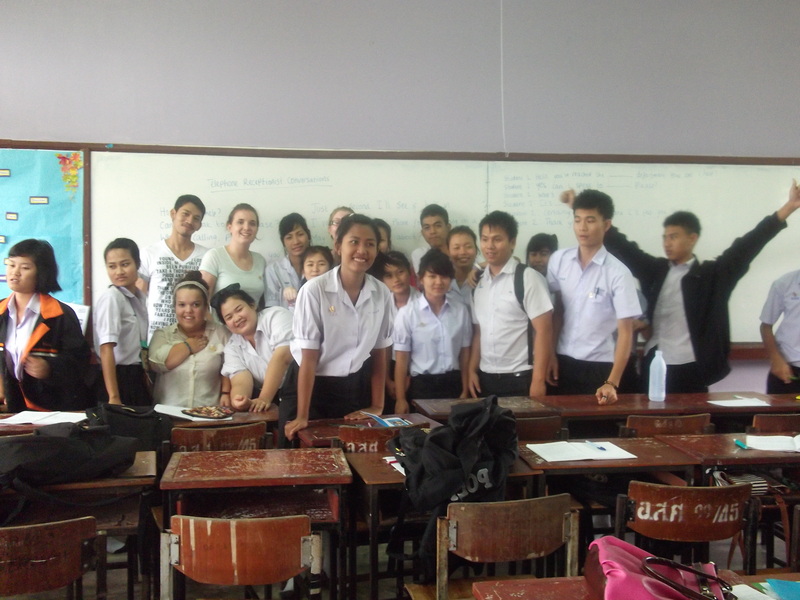 I visited Thailand to teach English to underprivileged children in a secondary school, aged between 11-19. 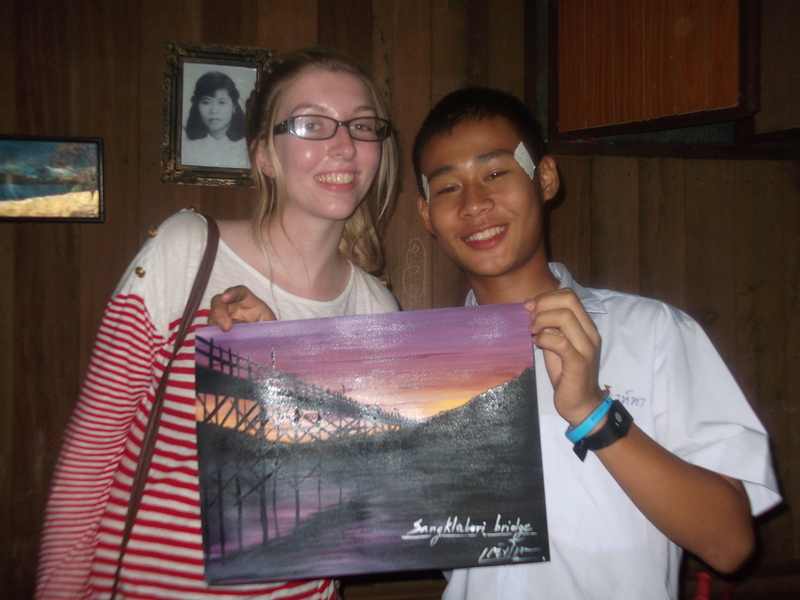 I taught in a small rural village in Thailand, called Sangklaburi for 4 weeks. There were many reasons why I decided to go and teach English in a rural area. Firstly, as I have already visited China and South Africa and worked in schools over there, I wanted to see how the education system varied in Thailand to the education system in England, China and South Africa. As I only partially worked in the schools in China and South Africa I was mainly focusing on the comparison of the Thai and English education system. Another reason for going to Thailand was because I wanted to share my knowledge, volunteer and give something back to the world, as life is so precious and these children that I worked with did not have a lot, some of them didn’t even have families. When I first arrived at the school I was very nervous, however from day 1 they made me feel extremely welcome. They asked me to introduce myself during their assembly on the main stage, which took place outside. I introduced myself and explained why I had decided to come out to Thailand. 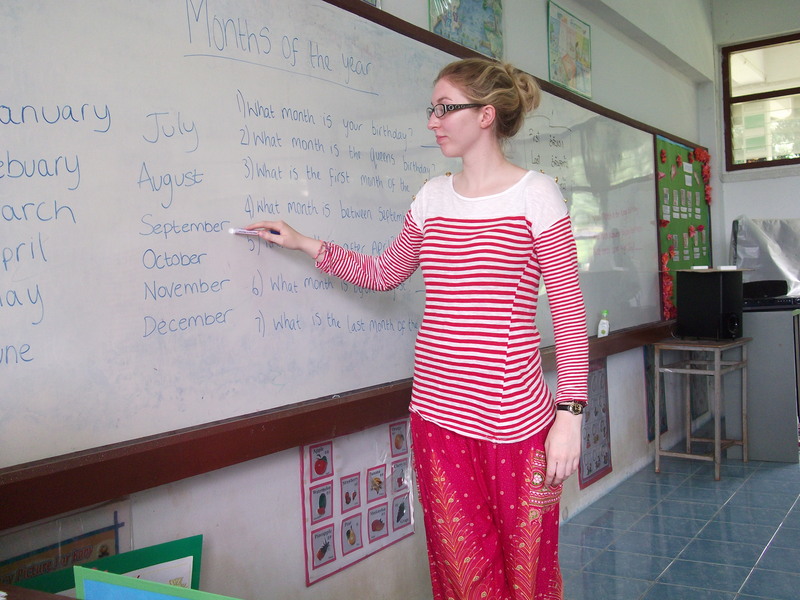 Both the pupils and staff seemed amazed that an English person was coming to volunteer in their school. They stared at you as if you were some kind of celebrity – which was very strange! After comparing the education system throughout my 4 week trip, one thing I noticed hugely was pupil’s behaviour and how the pupils behaved so exceptionally in Thailand. However, I didn’t really like how they disciplined their pupils – on a number of occasions I saw physical punishment where they were hit with a large stick or had their ear pulled if they were talking. I felt this was not the correct way to discipline their pupils. However, when comparing it to England, I feel that teachers should have more rights to discipline pupils if they are misbehaving. However, physical punishment is not the correct way. I also found that the pupils in Thailand actually wanted to be at school. Whereas in England some of the children don’t want to be there. In Thailand they seem to respect and value their education, even though, at least half of the children in Sangklaburi will never be able to leave the village. As they are originally Burmese and they have fled the Burmese border, Thailand will not give them a Thai nationality. Therefore, even though they are aware they will never be able to leave Sangklaburi they all still try hard in every lesson. They also respect their teachers, every time you walked past a pupil, they would bow their head to you and before and after every lesson the whole class would stand up and thank you. Whilst in the school, I taught a range of different topics from animal names to a conversation you would have in a restaurant. However, I found it very different to teaching in an English school, mainly because some had very little English and some had basic conversational English. However, there was no flow in lessons. Each time I worked in a class, we would do a completely new topic so one day they would be learning about the names of animals then the next day they would be looking at giving directions to a tourist. This made me realise how important it is and why in England they will do a topic usually for half a term, or at least have lessons follow on from the previous lesson. The school held a lot of events both for pupils and staff. Whilst at the school they had ‘ASAN’ day. 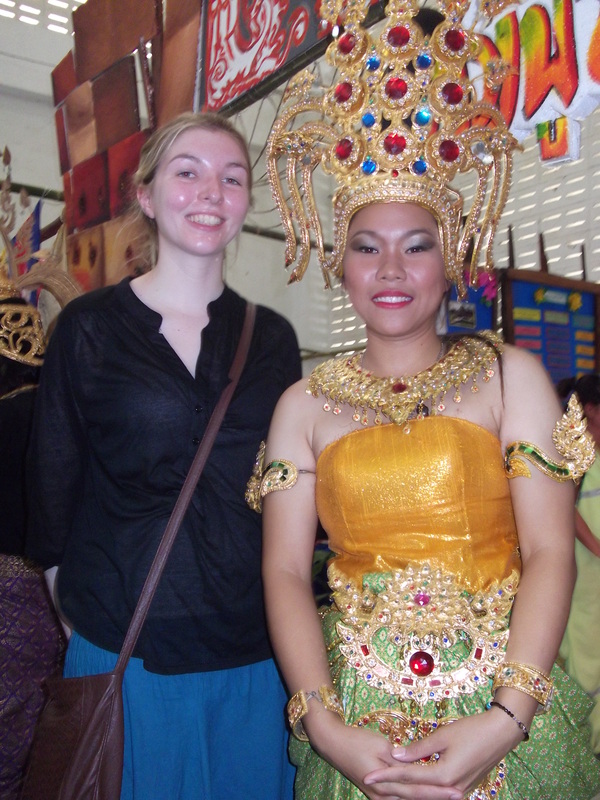 This was to celebrate and show that all of the ten cultures in Thailand can work together and be friends. It was a big exhibition that went on for two days and they had many guest speakers. All ten different cultures had their own exhibition in the hall with information about their religion, food and clothes they wear. I went round each stall and found a lot out; I also tried some very interesting foods! There was a day called ‘teacher day’ where students bought flowers in for teachers and pupils would come to the front of the hall and say thank you to their teachers, this was a lovely day and again it shows how much pupils value and respect both their teachers and education. Also, every Friday at the school, pupils wear their own traditional clothing; it was lovely every Friday to see all these amazing different outfits. It also showed that there isn’t a problem with racism, as all the different cultures will mix and work together. Unlike in England, racism can still be a problem. This is more so in South Africa, there is still a large problem with racism and it was evident when I taught in the school that pupils would not mix with other religions. During my time at the school, the head of languages was very keen for us to share our experiences of our own education and he wanted to see photos of our old schools. The reason for this was because he said he wanted to improve their school and improve pupil’s education and their behaviour. Right from the start I was honest with him and explained that the pupils at this school behave so much better than pupils in England and they actually respect their education. He wanted Thai schools to be like English schools. I was very sad when my time came to say goodbye to all the pupils and staff as throughout my time at the school I was always made to feel very welcome and nobody could do enough for me. My last day was on teacher’s day and I received some lovely flowers off pupils and as a gift from the school I received some lovely Thai clothing. They asked me to say a few words about my time at the school and about the pupils and throughout I couldn’t praise them enough. This trip has truly opened my eyes to the extent which in England children take their education for granted and has defiantly made me want to go back and teach in another part of the world. I would like to thank the Peel Eleanor Trust endlessly for the opportunity they have given me as it is a trip I will never forget!